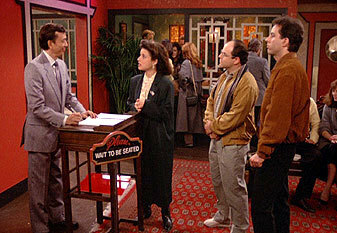 "The Busboy" was the seventeenth episode of Seinfeld to air, despite being the eighth produced. The episode was the 12th and final episode of the show's second season. It aired on June 26, 1991. Jerry, George, and Elaine are at dinner when a menu on an adjacent table catches on fire. George puts it out and explains to the manager that the busboy (David Labiosa) left the menu too close to a candle (although, in explaining the situation, he is hoping to get some free dessert as he is rather displeased with his pesto pasta) and Elaine jokingly declares she is never eating there again. The busboy is subsequently fired, upsetting Elaine and George. George and Kramer later go to his apartment to apologize, only to accidentally let his cat out of the apartment. A few days later, the busboy comes to see George, and tells him that there was an explosion at the restaurant, killing five employees, including the busboy hired to replace him. He thanks George for saving his life. Meanwhile, Elaine faces having her boyfriend (Doug Ballard) live with her for a week. Then, she tries to get him onto a plane back to Seattle, only to encounter a five-car pileup on Rockaway Blvd. With her boyfriend still with her, he gets into a fight down the hallway with the busboy, resulting in injuries on both ends.